#EuropeForCulture The 2018 summer calendar in the Certosa, Bologna Monumental Cemetery, is now here with a new series of night walks and events. The collaboration of various entities of Bologna allowed putting together a very rich programme featuring 50 events: guided tours, theatre events, itinerant shows, etc. A story about our history that, starting from that brutal event that was the First World War, re-proposes the values of pacifism and of the cohabitation between peoples and generations. Organised by La Baracca - Testoni Ragazzi. Tickets on sale at www.testoniragazzi.it. Tickets can be purchased on the day of the show, starting at 5.30 pm. Meeting point at the main entrance of Certosa (Church courtyard). 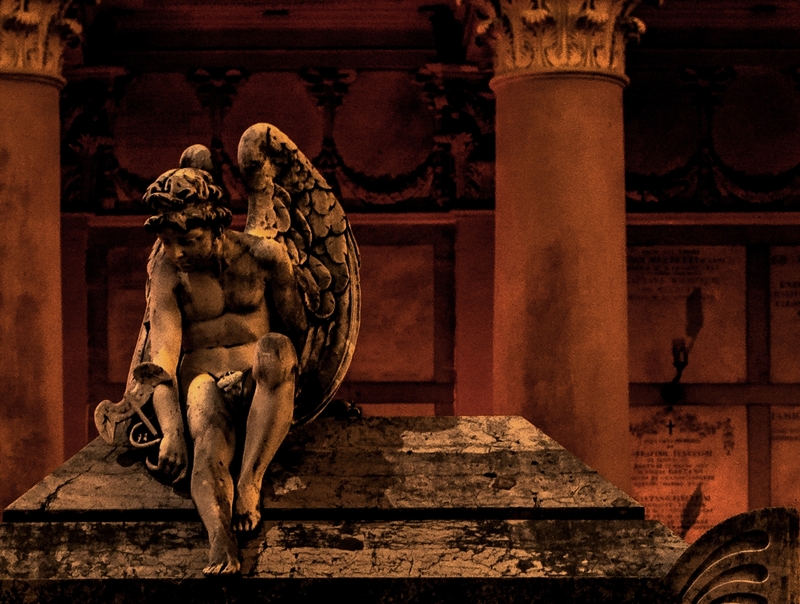 "Angels and demons: symbols and enigmas at Certosa"
Delicate winged statues, vigorous allegories and arcane symbols. Certosa was the scene of fantastic stories imagined by our ancestors, including amiable conversations with ghosts and flights of bats in moonlit nights. A nocturnal jaunt through art, literature and mystery. Organised by Didasco Cultural Association. Reservations required at 348 1431230 (afternoon – evening). Initiative for members of the Didasco Cultural Association, with the possibility of joining the association at the start of the visit. Membership fee € 10.00 (first visit free). "A cemetery that can be called Museum"
An invitation to explore Certosa through the eyes of young children as they learn about the largest monument in Bologna. Two events that are the result of work-study programme between the Museum of the Risorgimento and the C. Boldrini International Language High School. "Bologna's Certosa. An open book on history"
A walk for those who have never visited the complex of monuments, a primer for our Certosa: from the Etruscan necropolis to the monastery, from the institution of the "modern cemetery" to the most famous masterpieces, and many, many fun facts. Reservations required at 348 1431230 (afternoon - evening). An evening with Paola Redemagni, author of the book Una prece, una lacrima - Le lapidi cimiteriali specchio della società (A Prayer, A Tear: Gravestones As a Reflection of Society) (published by L'Ornitorinco), on the particular appeal of cemeteries and their role as archives of memory. Some short stories that had been lost but were then found. Certosa included. "Countrysides and views of the soul in the works of Enea Monti"
A presentation by Ilaria Chia of the artist Enea Monti (1855-1900), a pupil of the Collegio Venturoli of Bologna, a painter of landscapes and urban views. His work, which pertains to the second half of the 19th century, traces some of the most significant artistic experiences of the period, from 19th-century realism to the experiments of the Macchiaioli painters, to the pre-Raphaelite and symbolist suggestions of fin de siècle Rome. 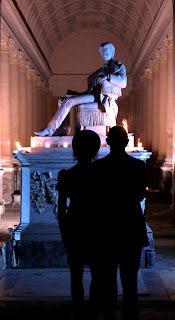 "Galvani High School and Certosa - Treasure Hunt"
Discover the cemetery by taking a walk with young men and women, visiting Certosa to get to know Bologna's largest monument. An event that is the result of a work-study programme between the Museum of the Risorgimento and Luigi Galvani High School. "Certosa underground - an unusual itinerary among unexplored cloisters and hidden corners"
Starting from Cloister VI we will explore the less known and less frequented places of Certosa, showing you galleries, evocative underground spaces and corners, taking in the whiteness of the marble, the richness of the bronze, the colour of the mosaics, discovering the more unusual side of the Monumental Cemetery. "A cemetery that can be called Museum. Works and artists of Bologna's Certosa"
In the 19th century the Certosa cemetery in Bologna was a destination for international tourism. Among the celebrities who admired its grandeur and beauty was the Russian statesman and historian Alexander Turgenev (1784-1846), who compared the cemetery with the Camposanto of Pisa, defining both as "museums". The exhibition is a reflection on the wealth of the heritage preserved in the rooms and cloisters of Certosa, on the impressive number of artists who worked there and on how the works evolved from an initial sketch to a fresco or sculpture in plaster, marble and bronze. The exhibit features some of the works and documents donated to the museum from 2009 to today, together with a substantial array of unpublished works from two private collections. The last donation is from the company Imbellone of Bologna, which presented the sketch of the Degli Esposti monument (around 1913) by Armando Minguzzi. Along with the exhibit there is a small photographic exhibition created by the Visual Arts group of the Friends of Certosa Association. It will be possible to enjoy the works of architects, sculptors and painters who have shaped the look of the cemetery, including Arrigo Armieri, Enrico Barberi, Alfonso Borghesani, Giacomo De Maria, Roberto Franzoni, Ercole Gasparini, Tullo Golfarelli, Armando Minguzzi, Luciano Minguzzi, Silverio Montaguti, Giovanni Putti, Pasquale Rizzoli, Giacomo Savini, Cesarino Vincenzi. A section will be dedicated to documents, among which stands out a selection from the vast collection of the marble company Davide Venturi & Figlio, donated in 2009 by the heirs to the museum. The only non-active presence in Certosa is that of Umberto Tirelli, chosen with one of his typical humorous sculptures as dedicated to Ercole Drei, who otherwise created great monumental works in Cloister VI, X and 1500.